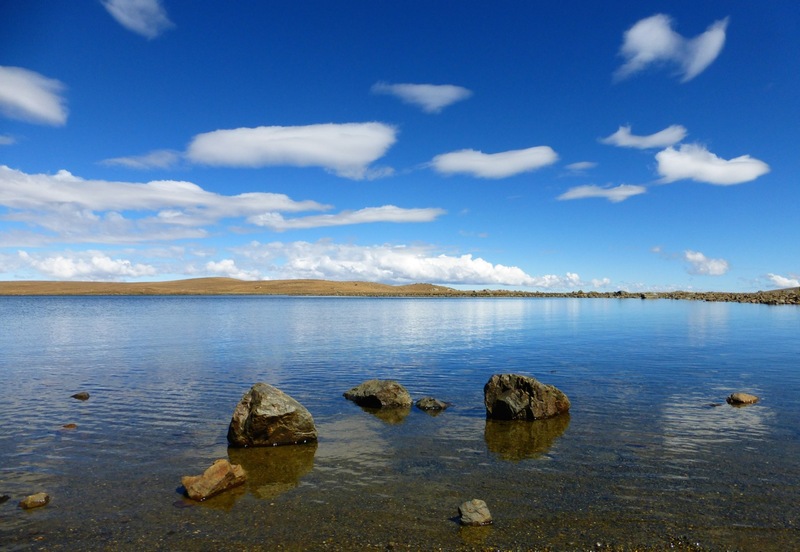 Setting out from Lake Queracocha just before midday, I made my way cross country over the wind swept, treeless landscape. Navigation was simple, but the uneven nature of the terrain meant that the going was steady at best. With an hour of daylight remaining, I ascended a small pass overlooking Lake Queshquecocha. The view was stunning. 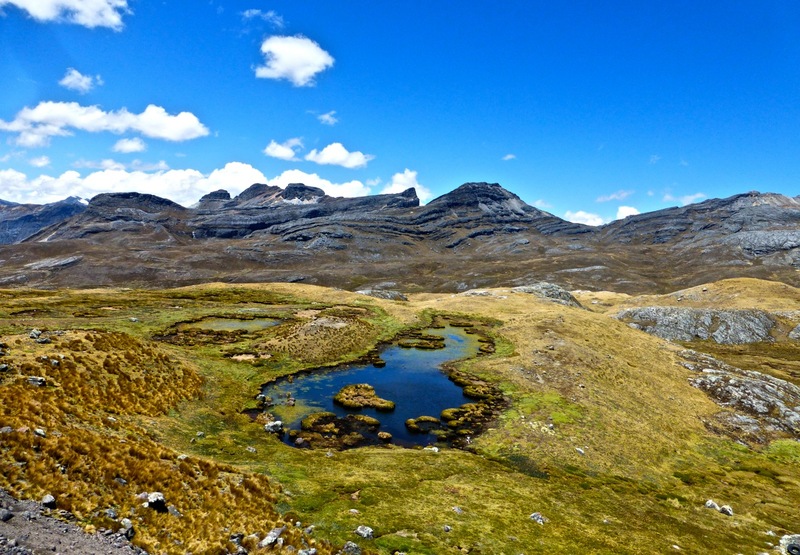 To the east lay it’s smaller sibling, Lake Jarpococha, directly behind which towered the snow capped peak of Nevado Pongos (5688 m / 18,661 ft). As impressive as these sights were, it was something else that captured my attention. 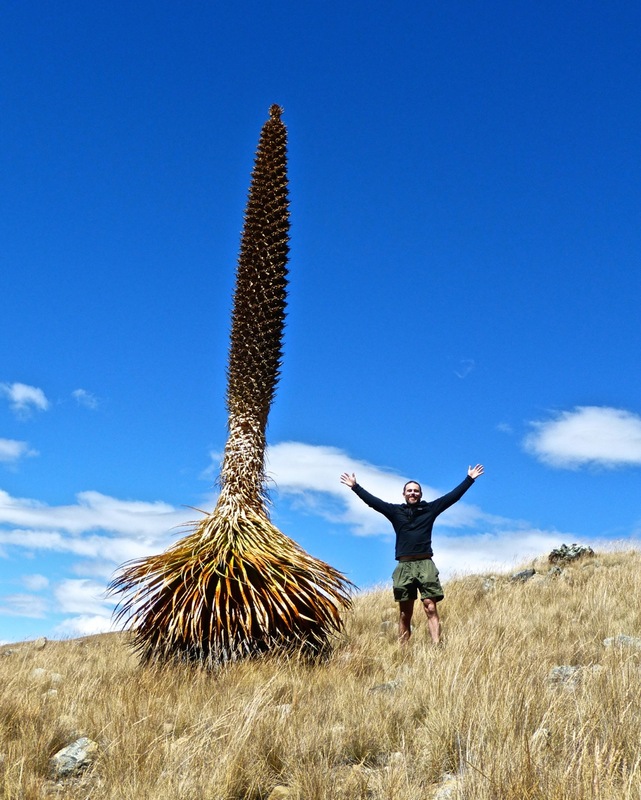 The first stand of Puya Raimondii that I had seen during the Cordillera Blanca Traverse. With temperatures dropping and more precipitation on the cards, the Universe threw me a timely accommodation bone in the form of a hobbit hole. It was actually another Shepherd’s hut, but as the door of the domicile stood no more than 3 feet high, I was forced to channel my inner-Bilbo Baggins in order to enter. It was a good decision. Freezing rain and high winds continued unabated for most of the evening, and my planned campsite on a small ledge overlooking the lake would have been decidedly less comfortable. After going over the maps for tomorrow’s route, I listened to an audiobook version of “The Lord of the Rings: Fellowship of the Ring.” Seemed appropriate considering my lodgings. Visions of Gandalf’s fireworks, Bag End and even the Green Dragon pub drifted in and out of my conscious as I nodded off to sleep. Setting out from my hobbit hole, the sunrise over Gueshguecocha was sublime. From the lake’s southern tip, I headed SE along the true right side of an unnamed arroyo (stream). The inclement weather of the previous days had given way to sunny and calm conditions. 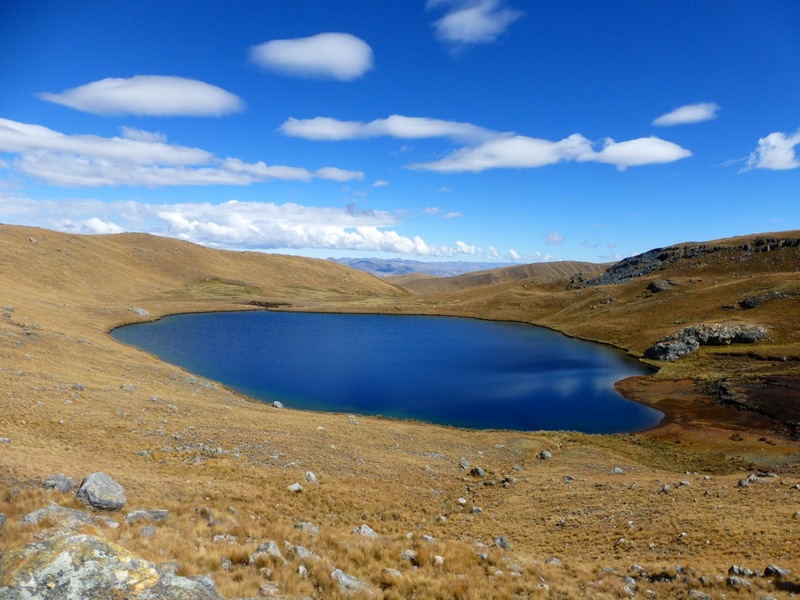 Ascending gradually, I soon came across a pair of smaller lakes, Mancancocha and Acococha. Together they constituted one of the scenic highlights of the final stage. Nice spot for breakfast. 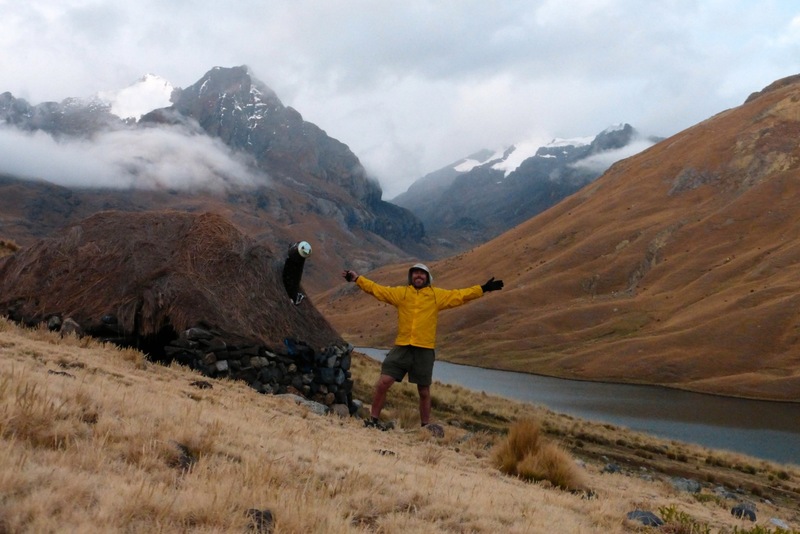 I Iocated a large flattish rock on the shores of Acococha, dropped my backpack and began to eat. The sun was shining, the temps had climbed to the high single digits (celsius) and the sky was a perfect azure blue. Clouds of all shapes and sizes drifted by. Once I had finished my meal, I lay still and closed my eyes; I began to daydream as I soaked up the early-morning rays. I felt grateful. Before leaving my rock, I went from a swim. One of only two dips I took during the CBT. Lakes at these altitudes tend to be a bit on the nippy side. Once I had thawed out and my voice had dropped an octave or two, I descended into the Quebrada Raria. I was immediately greeted by another small stand of Puya Raimondii. Upon reaching the valley floor I headed NE. The hiking in Raria valley was a mixture of animal trails, contouring and boggy bushwhacking. 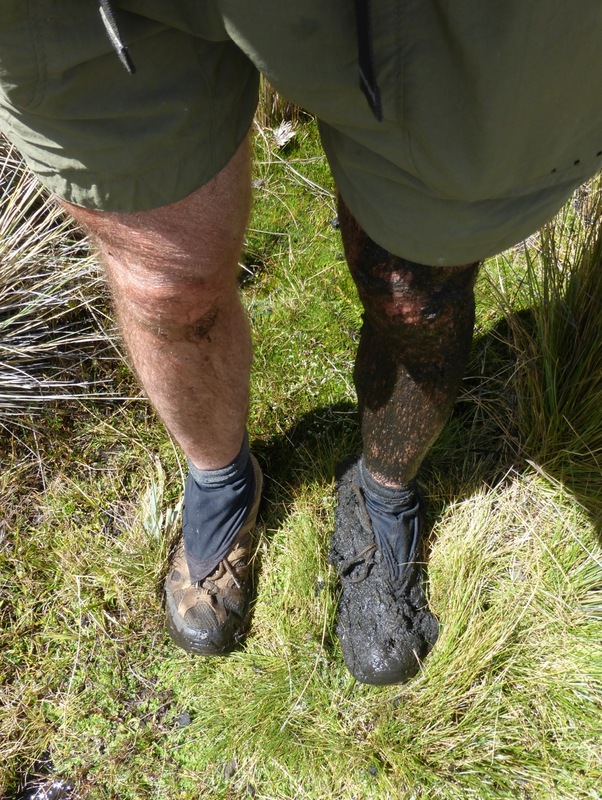 For the most part I managed to avoid the swampy areas; at least as far as my right leg was concerned (see photo). 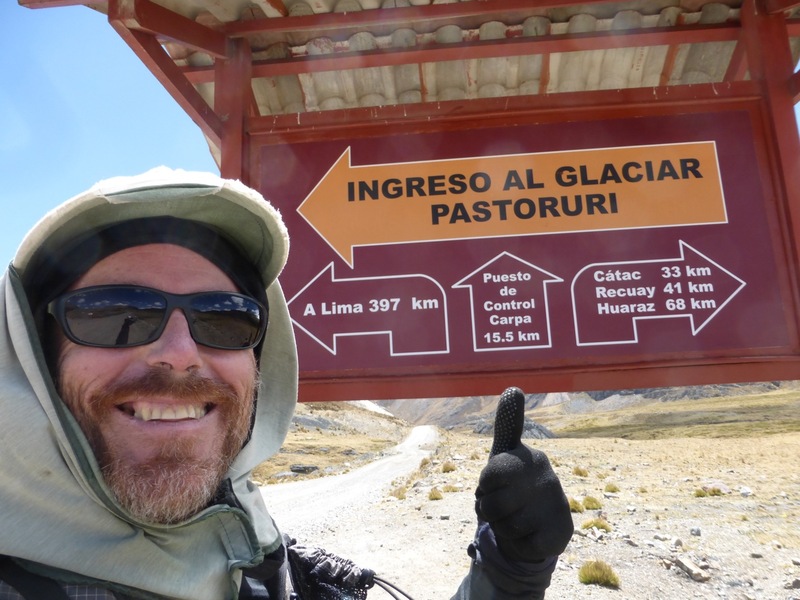 By late afternoon I had gone up and over Raria Pass (4795 m / 15,732 ft) and reached Quebrada Puchna. A scenic valley dotted with several small homesteads and a winding river through its centre, I would camp here for the final night of the traverse. 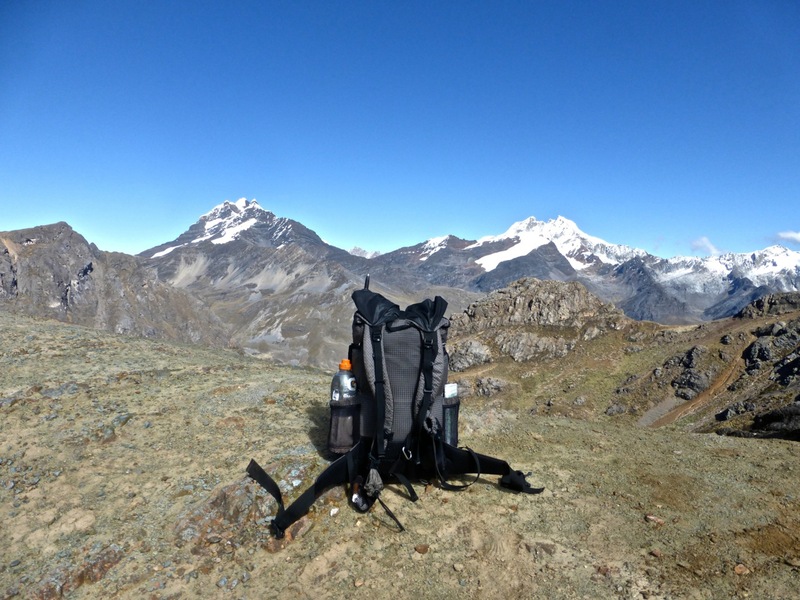 Whilst taking some compass bearings in anticipation of the following morning’s ascent, I was approached by two locals with homemade fishing poles. The usual conversation ensued…………“where are you from?”………”where are you going?”………”where did you start?”.………apparently the “three where’s” of conversing with foreigners in the Cordillera Blanca. Once the civilities had been addressed, I was invited to dine with my new-found acquaintances. Their names were Abraham and Juan and they were brothers. Their hut was only a few hundred yards away on the other side of the valley. There they were staying temporarily with their grandparents and two younger siblings. Fresh trout was on the menu. It tasted incredible. Equally memorable was the hospitality. The grandparents didn’t know much Spanish (Quechua being the local tongue), but their smiles and laughter spoke volumes. They mentioned that I was the first foreigner that they had ever sat down to eat with. The grandmother, who’s name was Dolores, complimented me on my table manners on four separate occasions! A night of firsts all around! I couldn’t imagine a more perfect way to spend my final evening of the CBT. 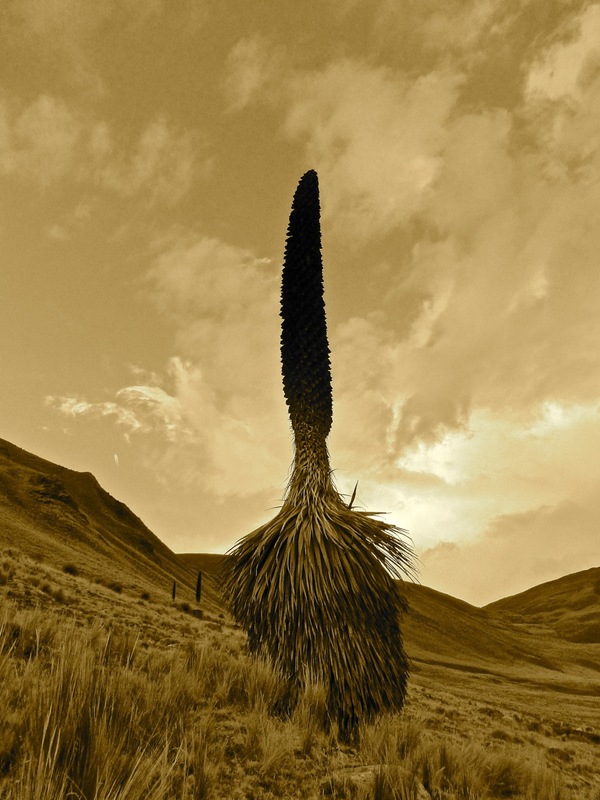 I ascended out of Pachua valley at first light. The temps were a few degrees below freezing, but after 25-30 minutes of climbing I stripped down to my shorts and long sleeved Merino wool base layer. It never ceases to amaze me how quickly one can warm up whilst climbing. What began as a fairly good donkey trail, soon disappeared entirely. Shrouded in morning mist, I stayed on a WNW bearing zig zagging my way up the steep, often soggy terrain. Eventually I rose above the clouds and by 9.30 am I had reached a small notch north of Gajap peak, the penultimate pass of the CBT. The last four hours of the traverse was relatively easy hiking. A brief descent followed by some contouring around the eastern slopes of Nevado Gajap and finally a two hour stretch along a little trafficked dirt road. 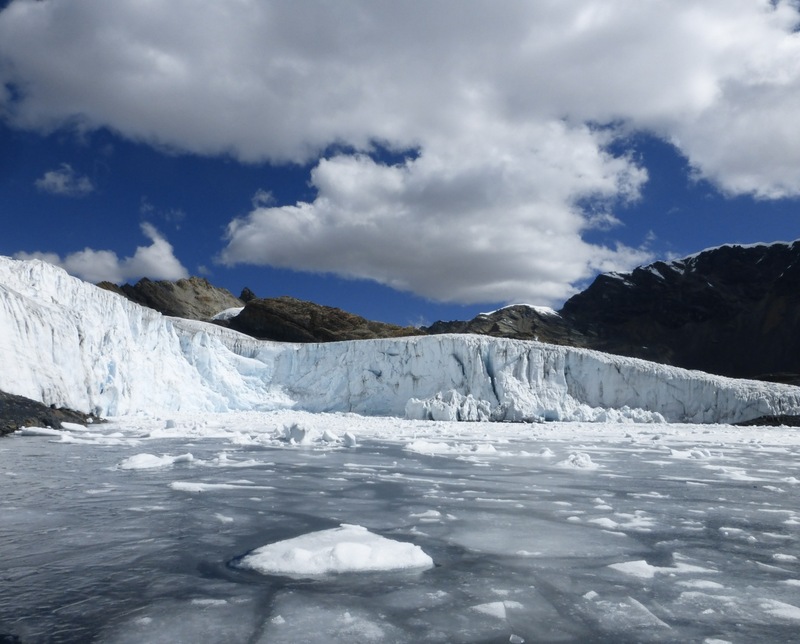 I arrived at Pastoruri Glacier just after 1.30 pm. I was happy, but not over-the-top, doing cartwheels, just found a golden ticket to Wonka’s chocolate factory, Julie Andrews singing from an Austrian mountain top happy. It seems like it has always been that way. Neither too up, nor too down. I reach the end of a trip and there is inevitably a feeling of continuance. An overriding sense of flow from one journey to the next. Irrespective of the duration, terrain, conditions or country that I happen to be in at the time. The wilderness always feels like home. Absolutely love your site and use it often in plans for new adventures, so thanks so much for your constant stream of information and a wealth of knowledge. I was wondering you opinion on the necessity of a deep proficiency in spanish for undetaking solo journeys like this. I am thinking of spending the summer in Peru next year and under taking a similar route along with many other excursions. 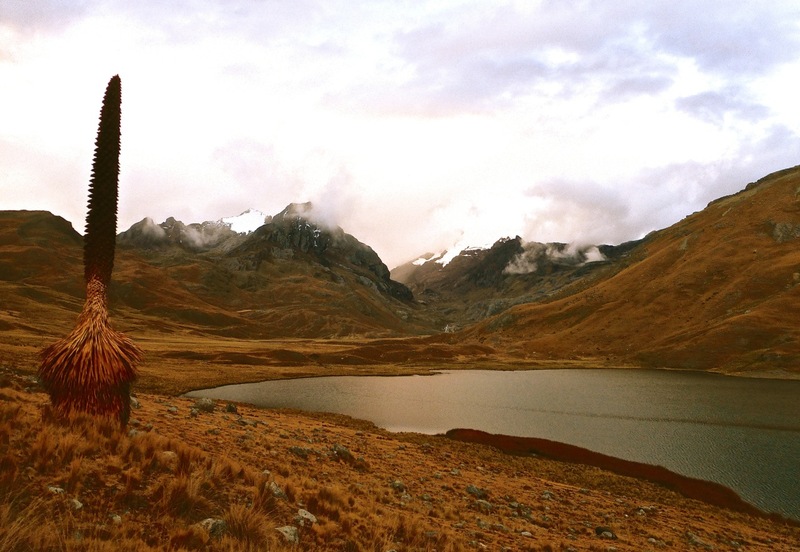 My spanish is limited, and I am planning to practice much bforehand, but I wanted to know if you thought a fluency in the language was essential for solo trekking and off trail trekking in the cordillera. 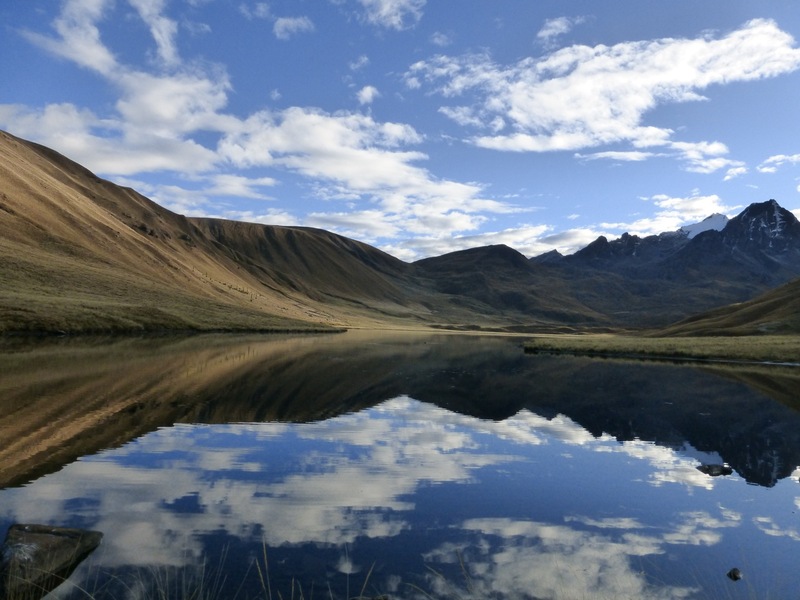 A good level of Spanish fluency will definitely make things easier once you’re of the beaten track in Peru. That said, if you can pick up at least a basic knowledge of the language you should be fine. 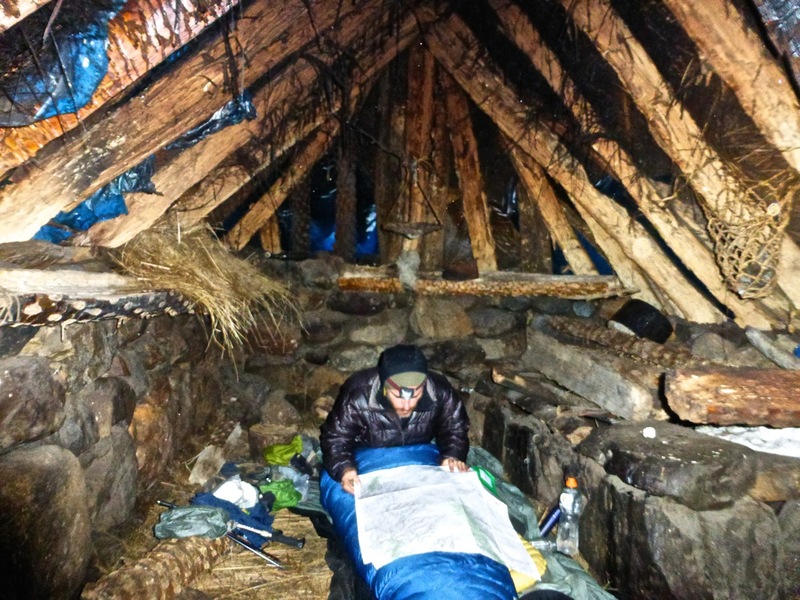 The biggest thing is to make an effort; if locals see that you are trying to communicate in Spanish (a few words in Quechua are also handy), they will be a lot more inclined to listen and help, than if you just start rattling away in English. All the best on your trip. It’s an incredible part of the world. Thanks Cam! That helps a lot. Two more additional logistical questions I was wondering if you do not mind: when starting out the second leg of your traverse, I am wondering how/where you passed between the Quebradas of Honda and Akilpo? 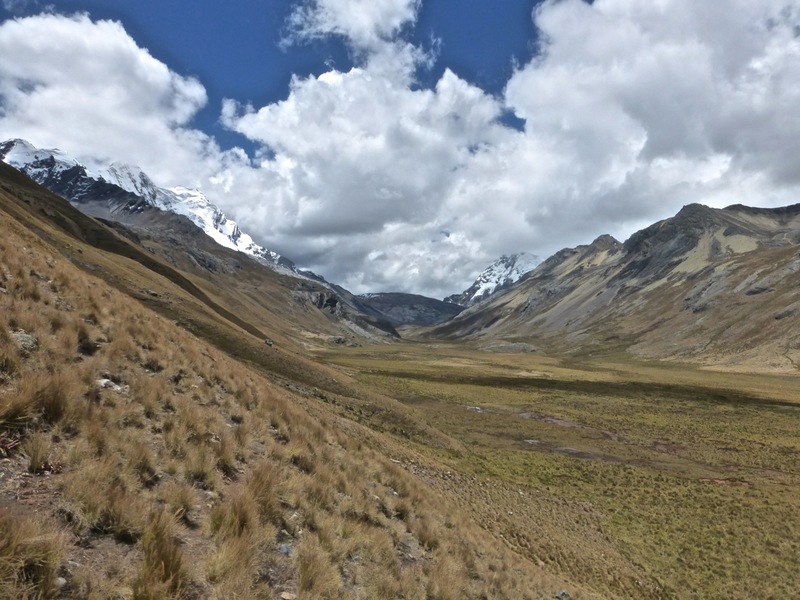 The second is that I am contemplating doing an abbreviated, backwards version of the first two legs of your traverse, starting in Pitec and making my way up Q. Quilcayhuanca, then heading northm eventually finsihing in Cashapampa. Do you foresee an logistical issues or hazards in working my way through the route in the opposite direction?? Due to the amount of enquiries I’ve received about this particular route, I hope to have a basic mapset out for it in the coming months. It has been on my “things to do” list for quite a while. In regards to your questions: 1. I followed the dirt road down to the end of Quebrada Honda and then cut across to the beginning of the Akilpo Valley and the enchanted forest. There is a cool waterfall very close to the beginning of the latter; 2. No, I don’t think there would be any issues going in the other direction.